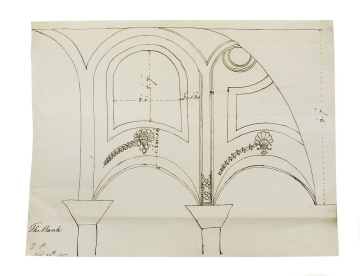 Drawing 6 shows part of the dome area of one of Taylor's south or south-east Transfer Offices marking out the proportions of the central arch. Part of the original decorative scheme is included: mouldings of swags over the arch and a vertical diaper pattern above the column shafts. This drawing also relates to the section shown in drawing 8.